Lil Xan’s anti-drug ballad “Betrayed” clarifies how self-sedating and hip-hop are far less of a love story, and far more of a toxically dependent couple. Drugs and Hip-Hop are a proverbial love story. From Biggie jotting down couplets about angel dust to Lil Wayne boasting about his brimful double-cups of sprite and codeine, self-medication has grown to be a normalized trope in the many spheres of rap music. That’s why it’s so refreshing when an emcee boldly decides to reverse the customary approach; to deglamorize drug abuse rather than hoist it on a romanticized pedestal. In the age of pharmaceutical fixation, namely the anxiety-reducing downer known as Xanax, LA’s internet-discovered rapper Lil Xan does just that with his hazy cloud-rap single “Betrayed,” a cautionary ode to the depressant and the often-unforeseen backlash such a self-destructive addiction can trigger. In the wake of emo-trap blender Lil Peep’s overdose on the same narcotic, it only seems appropriate to plunge into a song that operates as a cautioning about the drug, rather than a celebration. 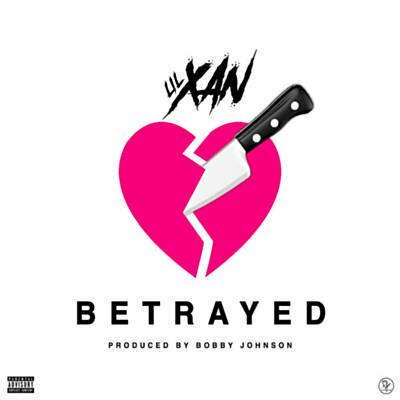 With “Betrayed,” Lil Xan clarifies how self-sedating and hip-hop are far less of a love story, and far more of a toxically dependent couple, insisting on making the impossible work for the sake of avoiding change. Outta sight, and my hoe got talent, right? How you make it up? How you fake a love? With long-time collaborator Bobby Johnson manning the instrumentation the track is launched with a sluggish, low-toned build that sounds like a cloud-rap anthem dipped in a vat of liquidated pharmaceuticals. It’s atmospherically drugged-out, prescribed to swamp the listener in the same stupor the drug itself would produce if taken: decelerated, drawn-out, and above all, lost. The second and final verse replicates the first in terms of shotgun-spread subject matter, even equipped with a sidesplitting wisecrack about a woman’s genitalia tasting an awful lot like skittles. As it swings back to the chorus once more, the beat begins to be played in reverse, all the while Lil Xan muttering the chorus over and over as if snagged on an infinite loop, a perpetual reminder that such a dependency will take you, fake you and eventually, tragically, the drug will betray you. All in all, “Betrayed” is an anti-drug ballad; a somber warning to fans – fans, mind you, who are majorly wide-eyed teenagers – that really isn’t sung enough. And Lil Xan, although on the surface appearing to be just another generic prototype in the long chain of recently budded Soundcloud artists, manages to pull it off. He simplifies a complex message, a memo that betrayal is a versatile creature, and in his case, like oh so many others, the creature takes on the shape of a pressed pill. Danny Dyer is strikingly handsome, overwhelmingly intelligent, and constantly sarcastic. Teetering somewhere in the vague space between a junior and senior at San Diego State University, he is an English major with a minor in marketing. He has contributed pieces for such publications as Malibu Magazine, Off the Rails Magazine and The Daily Aztec. You will most commonly find him in the center of attention, orbited by a laughing crowd, or reading under a shaded tree. When he’s not hunched over his weathered desk he is most likely shooting photos with his brother Petey and/or being loud in otherwise hushed public locations.